Abstract: Magnetic susceptibility (MS) and gamma-ray spectrometry (GRS) stratigraphy were used for correlation and characterization of eight Silurian-Devonian (S-D) sections in the Prague Synclinorium (Czech Republic). They represent two different facies developments: lower subtidal to upper slope deposits and slope-to-basin-floor distal calciturbidites. Sections from relatively shallow- and deep-water sections are easy to compare and correlate separately, although the detailed relationship between these two facies is still not entirely clear and correlations between the two settings are difficult. This may be due to sharp facies transitions and presence of stratigraphic gaps. The MS and GRS stratigraphic variations combined with sedimentologic data have been also used for reconstruction of the evolution of the sedimentary environment. The beds close above the S-D boundary show noticeably enhanced MS magnitudes but weak natural gamma-ray emissions. It may correspond to an increased amount of terrigenous magnetic material occurring with short-term shallowing (sedimentological evidence). In deep-water sections the uppermost Silurian is characterized by high MS and GRS values. It corresponds to a supply of recycled sediment to the lower wedge which occurred during the late Pridoli regression phase. The basal Devonian beds correspond to gradual deepening, but the overlying sequences reflect other shallowing episodes which are expressed in increasing MS and gamma ray activity of rocks. The MS and GRS fluctuations are interpreted as a result of local subsidence of the sea bottom along synsedimentary growth-faults and/or a biotic event rather than of eustatic sea-level changes. Abstract: At the NW inflexion of the Sava-Vardar Suture Zone ophiolite melanges, known as the Kalnik Unit, form the surface of the slopes of several Pannonian inselbergs in the SW Zagorje-Mid-Transdanubian Zone. The Mt Samoborska Gora ophiolite melange, thought to be a part of the Kalnik Unit, forms a separate sector obducted directly onto Dinaric Triassic carbonate sediments. Basaltic rocks, the only magmatic rocks incorporated in the melange, include Middle–Triassic (Illyrian–Fassanian) alkali within-plate basalts and Middle Jurassic (uppermost Bathonian–Lower Callovian) tholeiitic basalts. The latter sporadically constitute composite olistoliths, and are geochemically divided into N-MORB-like (high-Ti basalts) and transitional MORB/IAT (medium-Ti basalts). These geochemically different rocks suggest crystallization at various tectonomagmatic settings, which is also indicated by the rock paragenesis and host clinopyroxene compositions. Alkali basalts reflect melts derived from an OIB-type enriched mantle source [Ti/V=62.2–82.4; (La/Lu)cn=6.4–12.8] with Nd-Sr isotope signatures close resembling the Bulk Earth [εNd(T=235 Ma)=+1.6 to +2.5]. They are recognized as pre-ophiolite continental rift basin volcanic rocks that closely predate the opening of the Repno oceanic domain (ROD) of the Meliata-Maliac oceanic system. The high-Ti and medium-Ti basalts from composite blocks derived from a similar depleted mantle source (εNd(T=165 Ma) =+6.01 vs. +6.35) succesively metasomatized by expulsion of fluids from a subducting slab leading to a more pronounced subduction signature in the latter [Ti/V=31.6–44.8 and (Nb/La)n=0.67–0.90 vs. Ti/V=21.5–33.9 and (Nb/La)n=0.32–0.49]. These composite blocks indicate crust formation in an extensional basin spreading over the still active subducting ridge. The majority of high-Ti basalts may represent the fragments of older crust formed at a spreading ridge and incorporated in the melange of the accretionary wedge formed in the proto-arc–fore-arc region. The Mt Samoborska Gora ophiolite melange represents the trailing edge of the Kalnik Unit as a discrete sector that records the shortest stage of tectonomagmatic evolution related to intraoceanic subduction in the ROD. Abstract: The Slovenian Basin represents a Mesozoic deep-water sedimentary environment, situated on the southern Tethyan passive margin. Little is known about its earliest history, from the initial opening in the Carnian (probably Ladinian) to a marked deepening at the beginning of the Jurassic. The bulk of the sediment deposited during this period is represented by the Norian-Rhaetian “Baca Dolomite”, which has, until now, been poorly investigated due to a late-diagenetic dolomitization. The Mount Slatnik section (south-eastern Julian Alps, western Slovenia) is one of a few sections where the dolomitization was incomplete. Detailed analysis of this section allowed us to recognize eight microfacies (MF): MF 1 (calcilutite), MF 2 (pelagic bivalve-radiolarian floatstone/wackestone to rudstone/packstone), MF 3 (dolomitized mudstone) with sub-types MF 3-LamB and MF 3-LamD (laminated mudstone found in a breccia matrix and laminated mudstone found in thin-bedded dolomites, respectively) and MF 3-Mix (mixed mudstone), MF 4 (bioturbated radiolarian-spiculite wackestone), MF 5 (fine peloidal-bioclastic packstone), MF 6 (very fine peloidal packstone), MF 7 (bioclastic wackestone) and MF 8 (crystalline dolomite). The microfacies and facies associations indicate a carbonate slope apron depositional environment with hemipelagic sedimentation punctuated by depositions from turbidites and slumps. In addition to the sedimentary environment, two “retrogradation-progradation” cycles were recognized, each with a shift of the depositional setting from an inner apron to a basin plain environment. Abstract: Magneto- and isotope stratigraphic studies in the Vysoka Nappe (Hlboca section, Fatric Unit, Male Karpaty Mts, Slovakia) were performed. A generally decreasing δ13C isotope curve is interpreted as a primary trend from the Late Oxfordian (3.3 ‰ V-PDB) to the Late Tithonian (1.8–1.4 ‰ V-PDB). Data from the Tithonian part of the Tegernsee Formation probably reflect “local” basin processes connected with the breccia formation in the latest Tithonian/earliest Berriasian and/or with possible diagenetic overprint. The C-isotope record of the Berriasian Padla Voda Formation is more homogeneous (1.4–1.8 ‰ V-PDB) and assumed to be primary. Magnetostratigraphic investigations were focused on the Jurassic/Cretaceous (J/K) boundary strata. Upper Tithonian nodular limestones of the Tegernsee Formation differ substantially from Lower Berriasian calpionellid limestones of the Padla Voda Formation in rock magnetic properties. Hematite is present in the Tegernsee Formation, while magnetite is the only magnetic mineral of the Padla Voda Formation. Additionally, the latter formation contains superparamagnetic magnetite, which significantly influences its magnetic susceptibility. Correlation of normal and reversed magnetic intervals with the Late Tithonian global polarity time scale was supported by microfossil stratigraphy. M21n to M20n magnetozones were distinguished, including the short reversed Kysuca (M20n1r) Subzone within M20n. Interpretation of Lower Berriasian magnetostratigraphy was more complex due to presence of breccia horizons and a stratigraphic gap at the J/K boundary in the lower part of the Padla Voda Formation embracing M19r and most of M19n magnetozones. This formation was also partially affected by remagnetization. Detailed correlation between the isotope- and magnetic stratigraphy of the Tithonian–Berriasian interval between Hlboca and Brodno sections is also complex due to J/K stratigraphical gap within the Hlboca section. The primary B component accounts for counter-clockwise rotation of the Vysoka Unit with a magnitude of ca. 50°. Since the paleodeclination of Paleogene and Karpatian–Eggenburgian rocks in the area is similar, the rotation must have taken place after Early Miocene. The paleoinclinations of several Upper Tithonian–Berriasian sections of the Central Western Carpathians and western part of the Pieniny Klippen Belt are consistent and indicate paleolatitude of 27–30°N. Abstract: Mineralogy, fluid inclusions, C, O, S, Sr isotopes and trace elements have been studied in amygdule and vein mineralization hosted by the Lower Cretaceous effusive picrite at Honcova hurka (Silesian Unit, Flysch Belt of the Outer Western Carpathians). Besides dominating dolomite, magnesite, siderite, quartz, calcite, chlorite, glauconite, fluorite, barite, pyrite and millerite were also identified. The parent fluids are characterized by low temperatures (<50–170 °C), low salinities (0.4 to 3.7 wt. % NaCl eq. ), low content of strong REE-complexing ligands, δ 18O, δ 13C and δ34S ranges of 0/+14 ‰ SMOW, 0/–9 ‰ PDB and ~0 ‰ CDT, respectively, and initial 87Sr/86Sr ratios much more radiogenic (0.7060 to 0.7068) than those of host picrite (0.7042 and 0.7046). The fluids are interpreted to be predominantly of external origin, derived from mixing of seawater with diagenetic waters produced by dewatering of clay minerals in the associated flysch sediments. The isotope and REE signatures indicate interaction of at least a part of fluids with sedimentary carbonates. The interaction of fluids with host picrite led to strong alteration of rock-forming minerals and leaching of some elements (Mg, Ni, S, partly also REE) that widely participated during precipitation of vein- and amygdule-hosted mineral phases. Abstract: The Coka structure is a fault-bounded anticline in northern Banat, in the southern part of the Neogene Pannonian Basin. The structure and its vicinity were explored by 24 wells. 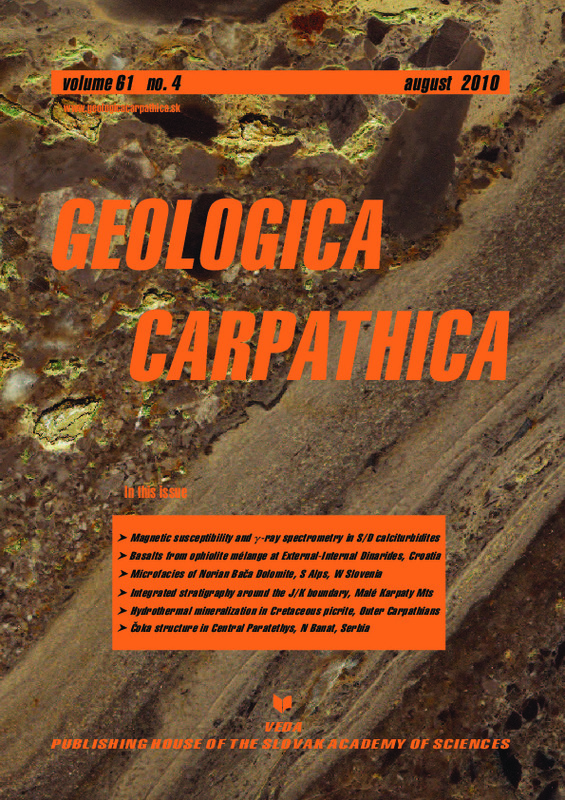 In addition to well logs, paleontological, sedimentological and petrological analyses of cores and 27 seismic sections with different parameters of acquisition and processing were used for geological investigation of the area. The E-SE dipping pre-Neogene basement consists of Lower Triassic clastics and, in the NW part of the study area, Paleozoic greenschists. Thin Middle Miocene (Badenian) sediments unconformably overlie the basement and pinch out towards the elevated NW part of the study area. They are also missing in some wells on the apex of the Coka structure, probably due to erosion. Badenian sediments were deposited in a shallow marine environment. The late Middle Miocene (Sarmatian) strata are missing and the Badenian is directly overlain by Upper Miocene (Pannonian) sediments. The latter also pinch out towards the NW but in contrast to Badenian sediments, they are present in all boreholes on the Coka structure. Pannonian deposition took place in a caspibrackish environment of Lake Pannon, with predominance of marls and fine-grained clastics. Pannonian sediments are conformably overlain by latest Miocene (Pontian) and Pleistocene lacustrine, alluvial and terrestrial sediments.